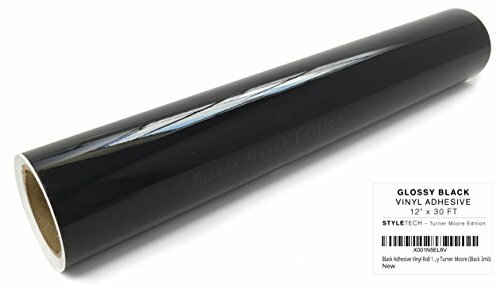 12" x 30ft premium black adhesive vinyl roll. This permanent adhesive vinyl is compatible with all personal hobby and craft cutters and can be used in many applications including windows, car decals, signs, stencils, scrapbooking or any permanent application. It can be used indoors but is waterproof and weather resistant making it the ideal craft vinyl choice for outdoor applications. Stronger than Cricut vinyl, comparable to Oracal 651, and cuts / weeds as easily. StyleTech's intermediate 3mil vinyl has lower shrinkage and better color stability than other films resulting in up to 6 year durability. Small characters process better and you never lose registration because of letters moving on the release liner. Designs can be adhered to Walls, Signs, Windows, Phones, Laptops, Metal, Glass, Ceramic, Porcelain and other Smooth Surfaces. Use in scrapbook layouts, handmade cards and invitations, labels, lettering, striping, stickers, banners, bumpers, mugs, glass tumblers, containers, signs, wall decor, wall quote/words, personalized art, jewelry, paper crafts, kid's projects, collage art, kitchen containers, coffee cups, phone covers, laptop covers, car windows, back-to-school and more. Tips: Self-adhesive vinyl works best on smooth non-textured solid surfaces. Use a squeegee or credit card to create adhesion with the transfer tape. 1 roll of 12" by 30 ft premium black adhesive vinyl. High gloss and smooth finish. Engineered for medium-term indoor and outdoor uses - lettering, marking, decals, signs and decoration. Compatible with Cricut Vinyl Expression Explore Maker, Silhouette, Robo Craft, die cutters, and all personal craft cutters. Premium processing properties for cutting plotters. UV resistant, permanent and water resistant! Highest durability on the market (6+ years outdoors). Ideal for indoor and permanent outdoor vinyl applications including car decals, home decor, wedding, signage, scrapbooking, window graphics, glass, DIY, coffee cups, mugs, stickers, phone covers, laptop covers and more.